Lauren is a busy mother of two magnificent children and loves music, food, and experimenting with her hairstyle. 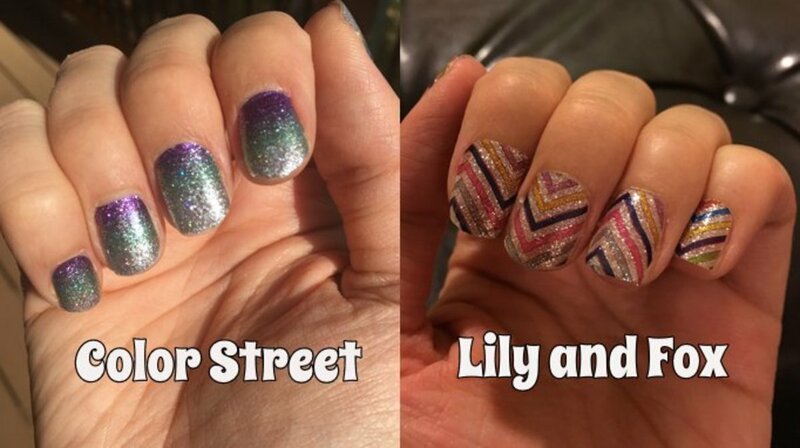 When I first began my foray into nail polish strips, there were few reviews on Color Street and none on Lily and Fox. So I decided to review and compare both companies so that others could be informed before they buy. Nail strips are an alternative to nail polish. They generally consist of a set of different sized strips that you peel and apply to your nails. Color Street is a direct marketing company founded in New York by Fa Park. Their patented products were previously sold in stores as Incoco nails, and recently the company switched to a direct sales platform and is experiencing massive growth. Lily and Fox is an Australian based online retailer. Their website offers only a vague account of their history and information. These nail polish strips cost $11-14 for each set, and shipping is $3.00. You can buy three sets and get one free, or for their French manicure sets, you can buy one and get one free. Each set comes with 16 nail strips, and you can usually use both ends of the strip. I generally do my nails twice with one set. These strips sell for a very palatable $2.99 per set, with free global shipping, although this is supposedly a sale price. The original prices are marked at $8.99. In the few months I’ve bought from this company, the sale prices have always stayed in effect. Each set comes with 16 strips, but I’ve rarely been able to use both ends of one strip. This company boasts vibrant colors and professional looking nails. The designs are a bit limited and they cycle through them often, but overall are contemporary and classy. These products are appealing and fun, and they’ve got far more variety than Color Street—they especially deliver some great designs for holidays. But some of the designs seem a little cheap looking, particularly when the colors are faded or the images are a bit campy. When I first tried these products, I was amazed by how easy they were to apply. It did take me a little while to get them lined up correctly on my nails, but after some practice, I was able to apply a full set in about 5 minutes. 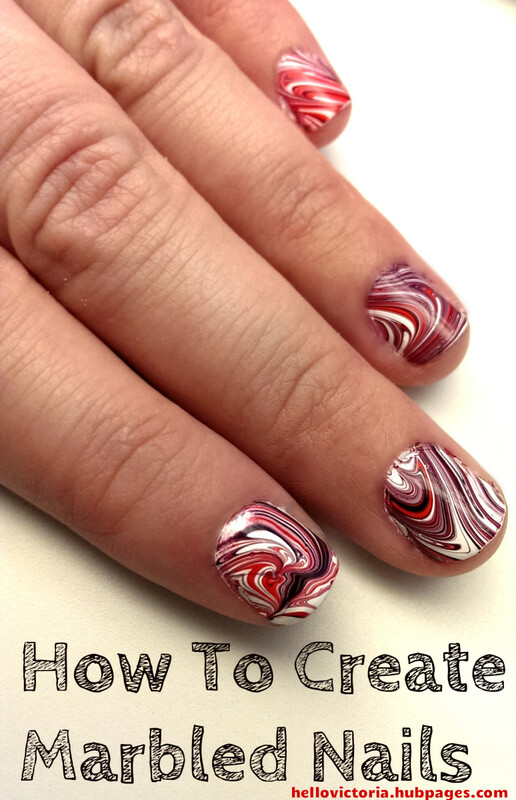 You peel off the strip, apply it to your nail, and file or tear off the excess. The strips are light enough to be able to stretch and fit easily. 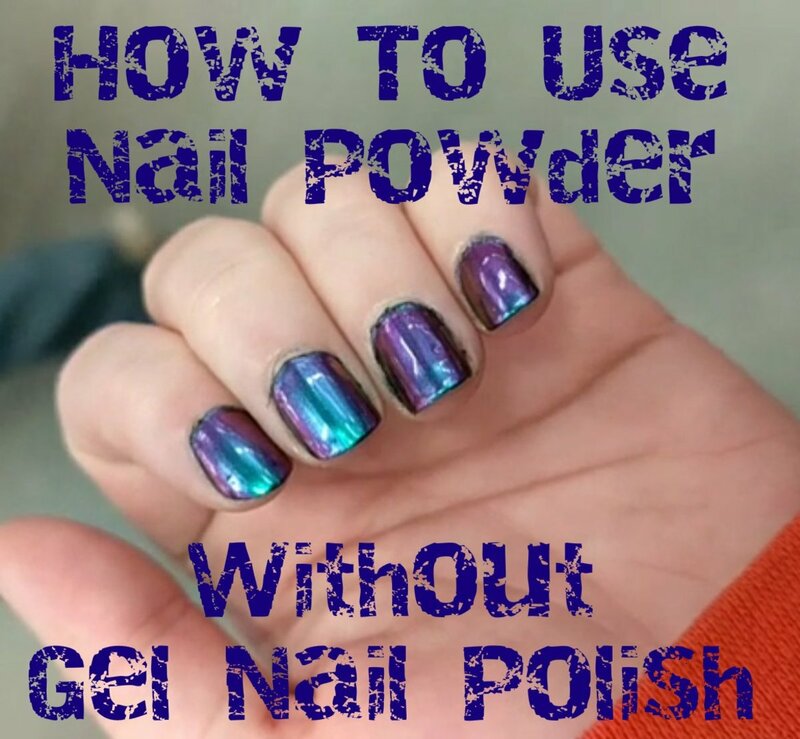 You remove the strips with nail polish remover, although it takes a lot of remover and rubbing to get it all off. The process for applying these products is essentially the same, but I’ve found it’s a little more frustrating. The protective sheet on the strip does not come off as easily, it’s hard to pull the tabs off, and the strips are so thick that you have to use a nail file to finish off the excess. The company’s website does not provide any insight on how to remove the strips, I generally just peel them all off when I’m ready to be done with them. The company says your applied nail strips can last up to two weeks, but unless you wear protective gloves all day or are an underwear model, this is probably not accurate. They will last weeks if you do absolutely nothing, but if you plan on dressing yourself, eating and preparing food, wrangling kids, or doing any other type of daily activities, these nail strips will chip and crack, although I feel they hold up better than a professional manicure. They also say their nails will last two weeks, but again, this is true if you do absolutely nothing. The difference with these nail strips is that they won’t necessarily crack or chip as much (these strips are incredibly tough), but I’ve found they do snag and stick to just about anything. Unless you file them off just right, water and dirt will get under them and cause them to easily peel off. Usually, I only keep these on for a day or so. On the occasions where I’ve kept them on for longer, they get a little warped and wrinkled. 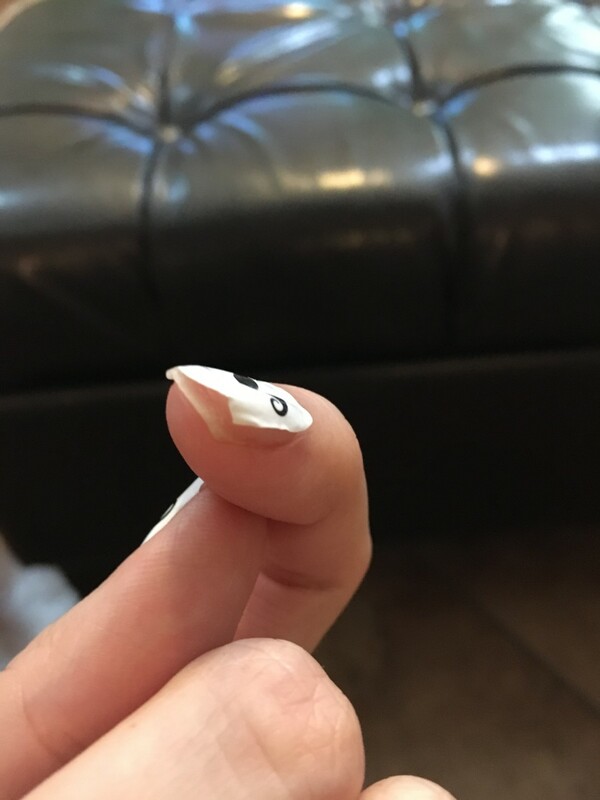 This Lily and Fox nail began peeling off a couple hours after application. I really do love the way these nails feel. They’re smooth and glossy, and they generally make my nails feel stronger. These also make my nails feel stronger, but they’re not smooth. Rather, they’re more rubbery and sticky. The company recommends painting a clear top coat over the strips, but what’s the point of having nail strips if you have to use nail polish too? Yes, I do mention the smell, and this is why. Color Street strips smell like nail polish, which I like. Not that I like the smell of nail polish, but since they claim that their strips are made from nail polish, and they come out of the package smelling as such, I’m more inclined to believe them. Lily and fox also claim their strips are made from nail polish, but they smell more like rubber. Are you sensing a theme here? I would actually recommend both of these company’s products. I would use Color Street more for everyday use where I’d appreciate the feel and longevity. The price point is a little hard to swallow, but they are still cheaper than most professional manicures. I would recommend Lily and Fox for events and occasions where I only need to wear them for a few hours. However, if their magical, ongoing sale should ever end and the price of their products jumps to $8.99, I don’t think I’d still purchase them. I feel both of these companies offer great products that ease the effort of applying nail polish and curb the cost of professional manicures. 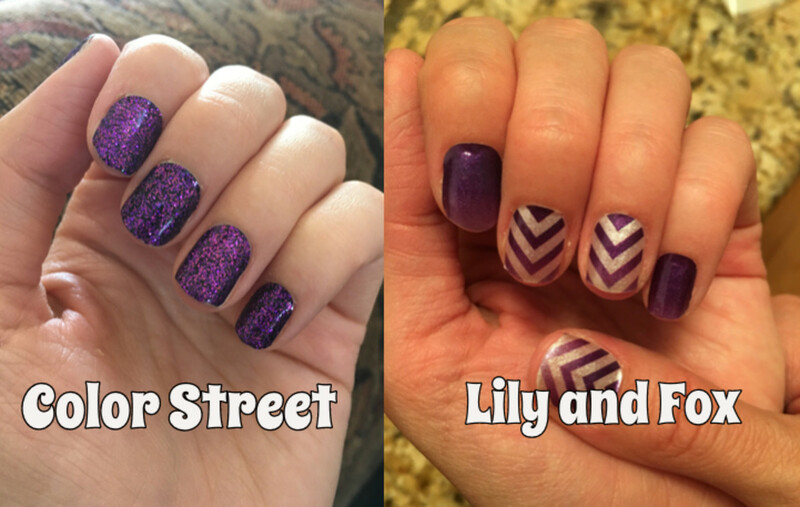 Which Nail Polish Strip Company Would You Prefer? Not to get off-subject, but does anyone know if Lily & Fox are the same nail polish strips as Perfectly Polished and Lucky Moose? The packaging for all of them is pretty much identical. Wondering if they're all the same exact thing just sold under different names? Thanks for the tip with the flat iron! What a great idea! I feel like Lily and Fox last longer because the strips are thicker, so that’s a positive. I’m glad you tried them out, they’re a nice alternative to the price of Color Street. Thanks for the article! Because of this I learned about lily and fox, and so far really like my first set. They've been on a week and look better than any of my colorstreet after that amount of time. I did hit them with a top coat when I got back home due to the rubbery tacky feeling and that solved it. Application was fine and I did clean my nails with alcohol like I do before colorstreet. I’ve had a fair amount of trouble with the Lily and Fox strips coming off soon after application. Although, I have better luck with them when I apply them at night before I go to bed. That way they have all night to bond without me doing housework and getting my nails wet. I don’t know if that’s helpful. Regardless, Color Street has the superior product. All of the Lily & Fox strips I've used are garbage. They lifted off within 30 minutes of application. I guess you get what you pay for. Too bad since L&F have so many more colors and designs. Oh well, I'll stick with CS, Incoco, Coconuts and Jamberry lacquer strips. 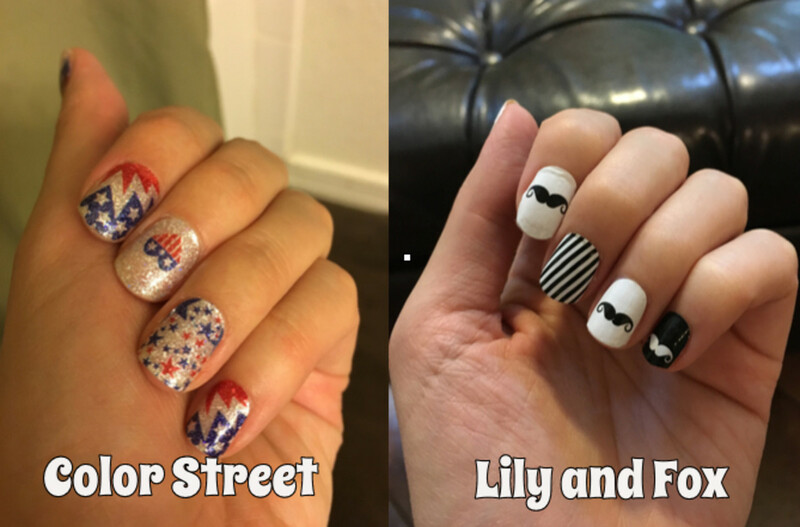 While Color Street does have a fair amount of designs, when compared to Lily and Fox they are limited, as they only have about half as many designs. Furthermore, a chunk of Color Street’s designs are solid colors and solid glitters, whereas Lily and Fox offer more variety in their styles. That being said, some of the Lily and Fox designs can verge on kitschy, while Color Street designs seem to be more defined and classy. Color Street is definitely the better quality product, however, I’ve found that the more I use Lily and Fox nails, the longer they last. Maybe I’m getting better at applying them or something. I’ve used Incoco now Color Street for years, they last weeks but will start to have tiny crack lines after a couple days. 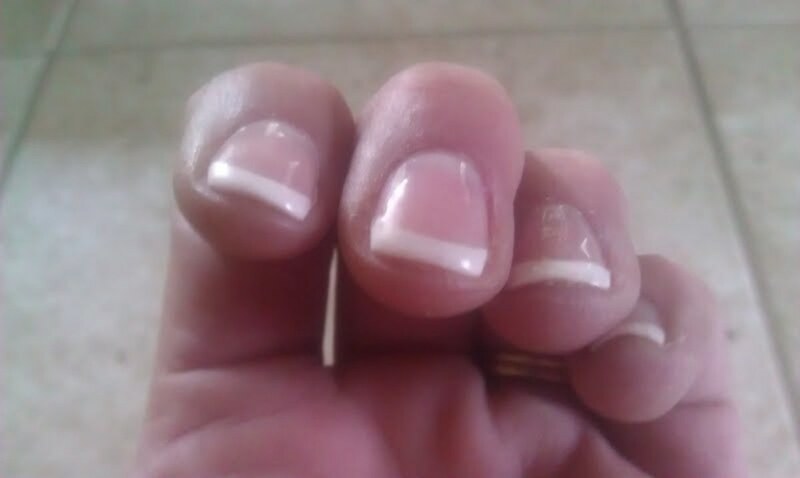 Its really only noticable up super close so I wear them til my nails grow out too much. I used my first Lily and Fox today, it lasted til I showered. I noticed 4 completely fell off and the others I was able to pull off without any trouble. Shortest time I’ve ever had my nails done for. Disappointing but I guess the price difference explains it. You can’t post pics in the comments, unfortunately, but if you have them posted elsewhere online you can share the link in the comments. I don’t know if that’s helpful. I love the glitter finish, and adding Miracle Gel over them makes them sparkle even more! Definitely with Incoco (I bought MANY Incoco nail strips before they transitioned to Color Street and still have tons in inventory), that makes them last longer. I'd never been able to grow my nails very long until I started using nail polish trips. Now I have nails anywhere from 1/8 to 1/4" beyond my finger tips. Love that! Day 4 now with Lily and Fox ("Cotton Candy" design) and they still look like they did when first applied. Can I post pics of nails? Thanks for those tips, I’ll have to try the Miracle Gel to take away the rubbery feeling. Also, what I like to do with Lily and Fox nails is use the ones that are slightly too small for each nail. 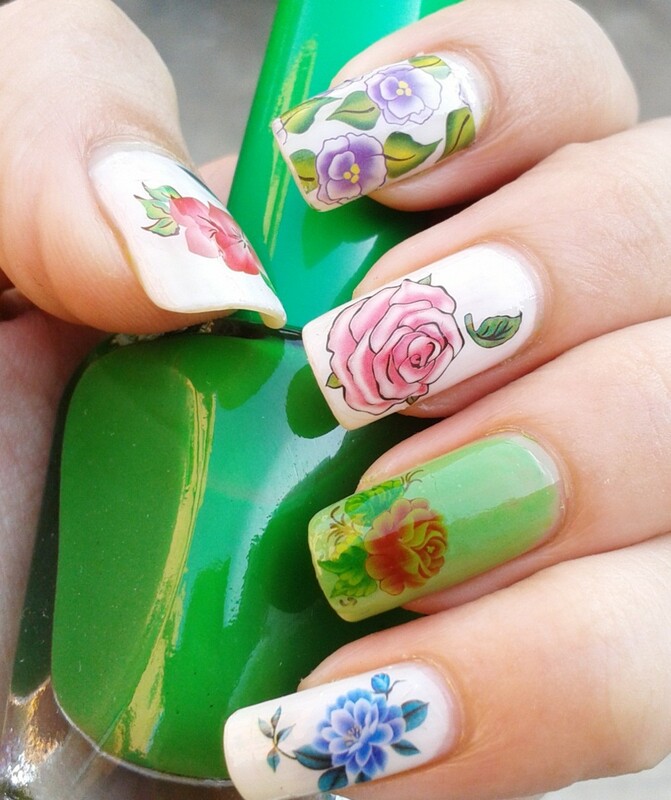 Yes, that does mean that parts of my nails show on the sides, but with some of the designs you really can’t notice. I find that this helps because I don’t have to shape them. I've used Incoco (dba Color Street) nail polish strips for years. I am currently wearing my first set of Lily and Fox. They take longer to apply because they are thicker. It is essential that you use an orange stick to make sure the sides are firmly attached to your nail. And they ARE hard to file and shape. But I've been wearing them now three days and they still look great ... no chips or lifting. I also use Miracle Gel topcoat with both products, which dries almost instantly. If you want them to last for at least a week (either brand), taking these two extra steps goes a long way to making that happen. Yeah, lily and Fox aren’t for everyone. But you bring up a good point. Incoco nails are Color Street nails, and you can buy them at Walmart or online for $5-$7. They’re still a great product at a lower price, but it’s kind of a slap in the face to any of Color Street’s stylists. I just tried Lily and Fox wraps for the first time and by the time I had the 3rd nail wrap on, the first one was coming off. They are so so thick. It felt like I was putting children's Colorforms on my nails. I threw the package out and put on Incoco and they're all perfect after 3 days. I have used both types. I now put a clear coat of nail polish over any that I apply. It only takes a couple of minutes to dry and helps the polish stay in longer. Sometimes the lily and fox last longer than color street because I have experienced more chipping with color street. The difference in price is why I prefer lily and fox. Color Street is great quality and you pay for it. I have found some Lily and Fox designs have stayed longer than a day. It seems their designs are not uniform, making me think they may get their products from multiple manufacturers. Lily and Fox are great for a quick, fun event, but the longevity and feel of Color Street is uncontested. I would just like to say that I too have tried both Colorstreet and Lily Fox. I bought some as Christmas gifts but wanted to give them a try first to see what I was gifting. Colorstreet came in the mail fairly quickly and Lily and Fox took forever. I was already a fan of Colorstreet but for the price of the other one, I had to try. I could not agree more with this well written accurate description. Lily and Fox were more like stickers than nail wraps. I will say though putting a 'quick dry' clear top coat over the Colorstreet really lengthens the life. Unfortunately as soon as I took a shower the Lily and Fox came right off. So they didn't last 12 hours and I will not be giving them as gifts. Well maybe to the 10 year old girls, but not the adults. Again, great article, veey accurate and well described. That’s great! I definitely think there might be some variation of longevity between some of the Lily and Fox styles. I’ve tried a couple that were truly frustrating, but other than those ones I’ve had a pretty good experience with them. I’m currently wearing a lily & fox set that I’ve had on for two weeks! They’re glitter so I’m not sure if that makes a difference but I’m very impressed. Def going to buy again. I have not tried Glitterati, I will have to check them out. Thanks for the tip! Have you tried Glitterati? I have tried all three of these companies and found that Glitterati lasted the longest for me as well as being cheaper than color street. You also get 18 strips instead of 16. Honestly, the more I use Lily and Fox, the more I like them. I still think Color Street are the better quality, and you pay for it, but I find Lily and Fox to be more and more acceptable for dat to day use. And I love their variety of designs! I love Lily and Fox! So easy to apply and really last. Dish washing house cleaning and all. I tried to order the Christmas wraps but were sold out, surprise! So excellent, I have tried a lot of wraps too. Please keep up the good work! Betsy, I actually had to go through a few failed attempts before I found a method that worked. After I use all the nails I need for the first time, I put the extras back in the clear plastic sleeve they came in, fold it over and tape it all the way around. I have found, however, that even with this method the remaining nails end up slightly more brittle than at first and shorten their life a bit, but I always get them to last at least a week. Katie, yeah, it always seems like the Color Street nails still smell like nail polish almost one or two days afterwards. It’s kind of weird. Did you notice the smell of the color street to go away? They were still smelling strong 12+ hours after application for me, which gave me a headache. Here are the links to the websites of these two companies, which I would imagine would be useful for anyone seriously considering buying their products.